In this part of the country, we associate lawns and lawn care with summer. Until the heat gets intolerable, we’ll spend as much time outside as we can, visiting with friends and family or working in our gardens. It’s important to remember that warm-season grasses need proper care all year long. Following our recommendations for fall and winter will help give you the lush, healthy lawn you enjoy in the spring and summer. The most common grass types in our area are Bermuda, Zoysia, and St. Augustine, since they are the varieties best adapted to our climate. For these lawns, fall means pest deterrents, winterizers, and fertilizers. Deploying the right amounts of these compounds at the right times will nourish and strengthen grass throughout the cold winter months. This drought-tolerant grass can thrive in a range of soils and loves the summer heat, but it can struggle in cold weather. A time-release fertilizer will sustain it through the winter months. A winterizer and a crabgrass deterrent are also recommended during this season. This grass type also does well during our hot summers, going dormant in winter as a defense against the cold. When it starts to turn brown, you might wonder if you’ll ever see your beautiful, dense lawn again. Appropriate fertilization during the fall and winter months, will help to protect Zoysia from diseases when it’s emerging from dormancy and most vulnerable. Regular aeration and dethatching will also help to keep this grass going strong. And of course herbicides should be applied if weeds start to appear. Because this grass can thrive under a wide range of conditions, the best approach to fall fertilization and watering varies. Depending on where you live, you may find that very little fertilizer is necessary to support St. Augustine in dormancy. The right amount of water is crucial to prevent burning without encouraging disease. Keep an eye out for brown patch and white grubs, which are also the major seasonal threats to St. Augustine. 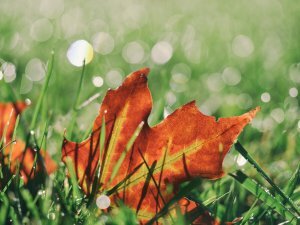 Finally, no matter what your grass type, a major fall priority is keeping your lawn clear of leaves, to ensure access to critical air, light, water, and nutrients. The moist, dark conditions under a leaf layer encourage pests and diseases. Rakes can also damage grass, so a leaf blower is preferable. Leaf-free conditions are best for both the grass you have now and the new seedlings that will emerge in the spring.